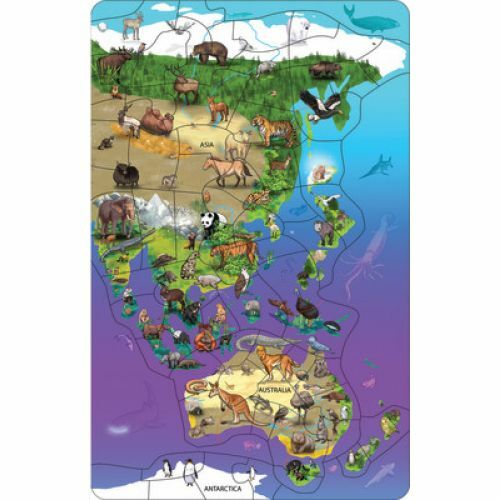 Set includes 3 Animal Magnetism® Magnetic Wildlife Map Puzzles. Discover 100+ endangered, threatened, and common animals in their habitats! 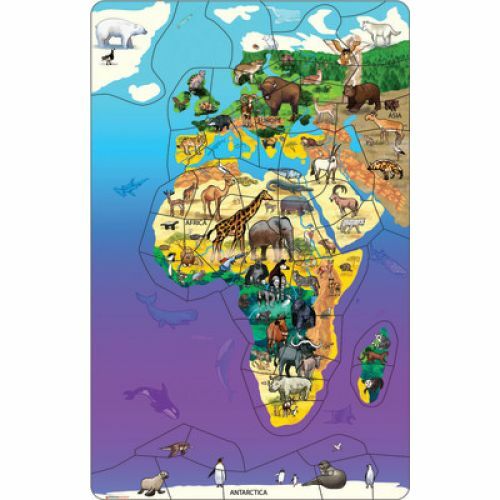 Learn geography and animal facts, build fine motor skills, and more! The board shows animal silhouettes and names to help children place the right pieces. Multi-continent puzzle (Eurasia, Africa & Antarctica) features hanger holes and stunning artwork in rich colors. Large animal fact sheet included. Hang separately or with our other two maps (sold separately) for beautiful, worldwide decor in the classroom, playroom, or bedroom! Ages 3+/Grades PreK+. Board measures 11.5" W x 18" H.
Discover 100+ endangered, threatened, and common animals in their habitats! Learn geography and animal facts, build fine motor skills, and more! Board shows animal silhouettes and names to help children place the right pieces. Multi-continent puzzle (Asia, Australia, and Antarctica) features hanger holes and stunning artwork in rich colors. Large animal fact sheet included. 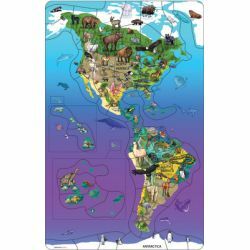 Hang separately or with our other two maps (sold separately) for beautiful, worldwide decor in the classroom, playroom, or bedroom! Ages 3+/Grades PreK+. Board measures 11.5" W x 18" H.